All the usual stalls, jazz band, activities and general good fun to be had. Bring your friends and relatives to help us raise money for the Church and the Village Hall. If you can help on Friday, 1st September, or on the day, please ring 720128 and offer your services. Books of all kinds are wanted for the Book Stall. Please leave them outside Jane Young's house (Elm Lodge) or ring her if you would like them collected - 720233. Carol Dunford has taken on the Toy Stall and would be pleased to receive good as new, clean and complete toys, children’s games and puzzles at Vale Farm. Collection can be arranged by contacting Gina on 720128. Interesting items of Bric a Brac can be delivered to Gina 720128 or Cass 720018. Extract of a letter from Mrs Hanmore, who lives in Chichester, regarding the two cleaned memorial stones in Longparish Churchyard. 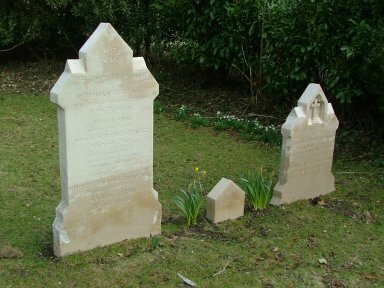 “You mention that people were intrigued by the two Stevens’renovated headstones. It never occurred to me that anyone would be interested in why this was done. Of course they are very difficult to miss. Thomas and Ann Stevens were my great great grandparents. Some years ago the Hampshire Family History Society logged the memorial Inscriptions in the churchyard. The inscription on the headstone of Lewis and Edwin Stevens was barely legible at the time I discovered Thomas and Ann’s stone, so I was very pleased to learn what was actually inscribed on this stone. (Lewis and Edwin being the children of Thomas and Ann). My daughter is very interested in genealogy and it is mainly because of this that I decided to have the stones renovated, so that she and her children could be aware of what was inscribed, when they visited the churchyard, keeping alive the memory of their ancestors. The idea of leaving the headstones for time to wear away what was legible bothered me. Someone had gone to the trouble of erecting the memorials and I just wanted the wording on the headstones to remain for many more years. I think BBC South Today would have found the explanation quite disappointing, boring even. Incidentally, I discovered the family headstones by accident. My father, who was born in Longparish, had no idea they were there. I wanted to take a photo of the church so my husband told me to go over to where those two stones were by the hedge, so I slung my handbag over one of the stones, took my photo, retrieved my bag and saw what was written there. I was overjoyed. Most of the inscriptions in the churchyard then were worn away by time, so I consider I was lucky that the inscription on one of them was legible. Thomas married Ann Poore in St Mary’s Chapel, in the parish of St Mary Bourne 13 July 1839. She was the daughter of Henry Poore a local farmer. I have researched the Poore family back to 1701 with certainty, though I believe they were living in St Mary Bourne in the 1500s. The 1841 Census Returns show Thomas living in St Mary Bourne, occupation harness-maker. By 1851 he was living in Longparish in what is now Saddler’s Cottage. There were ten children in the family, 5 being born in Longparish, the move to Longparish occurring approximately in 1849. The saddlery was established in 1828. I have a photo of my grandfather standing in front of the board stating he was a Saddler/Harness-maker, established (the date being obliterated by grandfather) –most inconsiderate of him! In the right hand corner of the cemetery, tucked up cosily together, there is a memorial to William Couzens. his first wife Jane, and 2nd wife Sarah Couzens, née Stevens, formerly Townsend; her son Henry is buried with his grandparents in the churchyard.